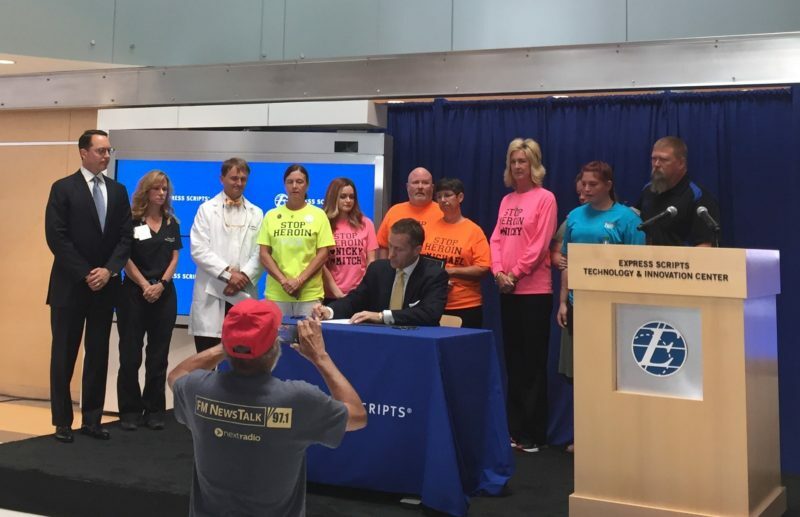 ST. LOUIS – In a surprise announcement on Monday, Governor Eric Greitens detailed his plan for Missouri to take up his version of prescription drug monitoring. The announcement was made at Express Scripts in the Governor’s hometown of St. Louis. It was announced on Monday that the state would enter into a contract with Express Scripts to set up the system. On Tuesday, The Missouri Times learned that Express Scripts received a no-bid contract for their assistance in setting up and maintaining that database. Department of Health and Senior Services Randall Williams says that contract would carry about a $250,000 cost to set up the program and that his department would need to add staffers to administer the program. But the question many are asking is about the contract itself, as all state purchases over $3,000 are subject to competitive procurement requirements. For all purchases of $25,000 or more, a formal, sealed, and advertised procurement method is required. Express Scripts is currently under contract with the state to offer prescription drug plans to state employees and administer benefits. Brian Henry, the spokesman for Express Scripts, said the company will follow any guidelines that are requested of them. The measure has been defeated in recent years with staunch conservative backlash. A spokesman for Greitens did not immediately respond to a request for comment. over Greitens executive order and the PDMP contract – Clayton Times <Liked it! just too great. I actually like what you’ve acquired right here, certainly like what you are stating and the way wherein you are saying it. blog. It’s a very easy on the eyes which makes it much more enjoyable for me to come here and visit more often. I feel that is among the such a lot important info for me. And i am happy studying your article. to now? I surprised with the research you made to make this particular put up extraordinary. I believe what you posted made a bunch of sense. But, think about this, what if you added a little information? I mean, I don’t want to tell you how to run your blog, but what if you added a headline that makes people desire more? Hello to all, it’s in fact a fastidious for me to pay a quick visit this website, it includes valuable Information. If you want to increase your knowledge only keep visiting this website and be updated with the latest news posted here. but I know I am getting know-how everyday by reading thes nice articles. Awesome! Its truly amazing piece of writing, I have got much clear idea regarding from this post. I just want to say I am just newbie to weblog and truly loved you’re web blog. More than likely I’m going to bookmark your blog post . You really have really good articles and reviews. With thanks for sharing with us your web site.
) I take care of such information a lot. I used to be seeking this particular information for a long time. existing at this site is truly wonderful. Great goods from you, man. I have be mindful your stuff prior to and you are simply too great. I actually like what you’ve received here, really like what you are saying and the way in which by which you are saying it. I’m a young adult and I heard that you can actually make money for things similar to this. I’m experienced with computers as well as have great literary works skills as well as I’m sure I can create successful blogs/articles … On a different (kind of) subject, would I have the ability to join associate programs?. Great blog you have here but I was wondering if you knew of any discussion boards that cover the same topics discussed here? I’m locating them for my sis. I’m searching for one of the most recipes with images and the ages of baby for the recipes. Blog sites are generally where I would certainly anticipate to discover them. I’m impressed, I must say. Rarely do I encounter a blog that’s both equally educative and engaging, and let me tell you, you’ve hit the nail on the head. can you offer guest writers to write content for you? I wouldn’t mind creating a post or elaborating on a few of the subjects you write regarding here. Excellent site you have here but I was wondering if you knew of any discussion boards that cover the same topics discussed here? I am changing hosting business as well as would love to move my WordPress Blogs over. Does any individual understand of a very easy method to achieve this?. Wow! Finally I got a webpage from where I be capable of truly get valuable data regarding my study and knowledge.